While feeling so happy and excited about heavy showering, along with thunderstorm last evening the collapses of 11 storey building on the western suburb has brought down the enthusiasm of Chennaities. It rained heavily for about an hour pulling down the temperature as much it could, but inside the house it was a blend of hot and cool, since it was hot until 4pm when the sky turned gray and later become dark with clouds. I wake up my mom, warning about the dark sky and thus she happen to collect the cloths put to dry at the backyard cord before got wet in rain. The wind brought chillness through the open windows and the heavy rain created pools across our streets, sending water into our compound which reached up to our doorstep. It was fun watching the ripples created by passing vehicle making small waves rushing into our house but the water reduced as soon it stopped raining. The rain emerged in huge drops making knocks with the plastic car shelter and poured like empting the clouds with no drops left for rest of the days. But I couldn’t go out and enjoy the water coming into our house fearing about the thunder lightening, which was the result of the collapses of the 11 storey building. Eyewitness says that as soon the thunder hit on the under construction building, it came down like collapsed play cards. It seems there were about 100 workers on the building site while it collapses and being Saturday, the weekly wages disbursement day, the workers were gather on the first and second floors. With current report 11 workers have confirmed death and more than 50 still trapped inside the collapsed building with 20 recovered as injured. It seems thunderstorm could be just one of the reasons for collapses guess the officials, who are yet to see others. The rescue operations are expected to last for 2 more days with number of fire service men at work. Wish there wasn’t rise in toll! 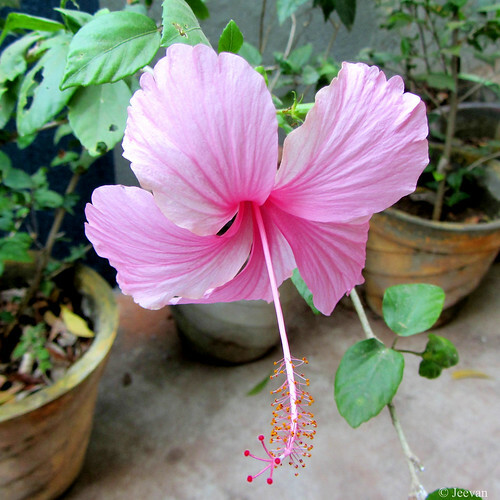 The Dainty Pink Hibiscus is a tropical flower that has shown some grace over our flower pot. 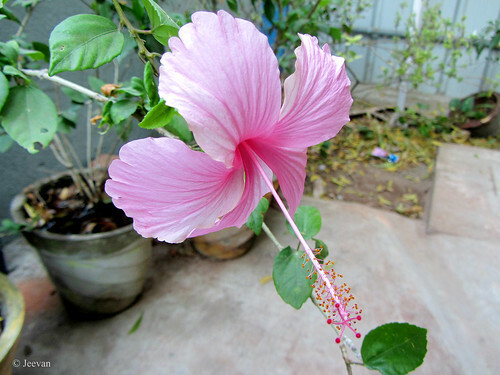 Elegant light to medium pink, the hibiscus flourishes throughout much of the year. Dainty Pink or La France Hibiscus, a vigorous upright grower with immense flower power is an old heirloom tropical hibiscus cultivar, which is believed to likely be the result of hybrid cross. Dainty Pink hibiscus is also frequently confused with Anderson’s Crepe Pink, which is similar in color but has larger blooms, as well as a larger and more weeping growth habit. It is typically genetically unstable and will frequently suddenly develop an odd limb with a white or pink and white striped flower. Although it is a very beautiful and versatile plant for the tropical landscape, by the mid 1980s it had virtually disappeared from the commercial market, as it is not well suited to mass production, storage and transport. Last year the vacation for schools was extended by government due to hot weather, but I felt only hotter this year where schools opened as early as 2nd June. Glad at least the 11th standard students enjoyed holiday till Monday and there is a reason for me to be happy since one of my dear cousins is entering 11th, I got enough time to spend with him. He was a great company for me these days and aided me in getting small works done and we also enjoyed playing cards, dice and going out in evening and night and moreover had a vacation together in hill-stations. We were going through some difficult phase these days, shifting me from either wheelchair to car or car to wheelchair. Since we own SUV, my father couldn’t put me into the SUV unlike post fracture in my femur and the lack of ability to stand now make it troublesome; and only my brother could carry me in and out of the SUV. But we couldn’t always depend on him to travel, so we were looking for alternate ways to make shifting. We approached few mobility aids manufactures in Chennai to help with transferring devices, but each have different ideas which has nothing to do with our SUV. Actually I don’t have a mind to give away my favorite car (Mahindra Scorpio) which takes me anywhere I want and I also couldn’t find a comfort seating like Scorpio in which I could take long drives without trouble. I was anticipated to fit with a Turny swivel seat for the transfer, but when enquired with a company in CBE, it seems to cost more than buying a car. Later I find the ‘person hoist’ which I though could be lesser in amount… but it is only available in foreign and there isn’t sure about the parts getting here if it went wrong. To breathe little, one of the mobility aids manufacturer has assured to do something without exchanging my favorite car and he is already in progress with a wheelchair seat transfer into the car and he has asked to check with the device next week when it completes. In-between we test drive the Maruti Ertiga (a neighbor’s car) which I think could be the last solution if nothing works above. You may ask why Ertiga? Because it is the only MPV that resemble a car in every aspect and also no need climbing in and out of the car. It is a 7 seater which could reduce to 5 if wheelchair is placed on the boot. It has lot of features and option for a family car… a small seat turner could make seat into the car. The thing compact is something always get me into it and no matter what, I like things that are compact and neat. The power wheelchair I use is very compact that nowhere in production now. Just like that Ertiga is a compact MPV that attract me lot! Back to weather condition, the hot atmosphere has put me always tiresome which could be one of the reasons for the lesser post in my blog. It also prevent me from eating well and waking up early in morning (usually never less than 8.am), and having throat trouble due to over dryness at night. Wish there was showing! Referred to the yellow bag (Manjapai) is a family entertainment (Tamil) film based on grandfather-grandson relationship. Manjapai is a popular concept used in Tamil cinemas, where the hero or any other characters coming from village to city is often shown carrying a yellow bag. In this film the Manjapai is related to the grandfather character, who comes to the city for the first time to stay with his grandson who is suppose to pursuing career in US. The film has many funny scenes and light-hearted moments to sit back and relax except for the emotional break up at last. The young actor Vimal had chose to play a software engineer in the film, dream to settle down in US and in a brief time he created the opportunity and working towards achieving his goal. Meanwhile he brings his only grandfather from the village to stay with him until he left to US and his grandfather, being so ignorant, pulled him into lot of trouble which even threatened his US dream. The veteran Rajkiren has lived as grandfather, not only to Vimal but he reaches up to the audience watching the film! He had played father role in many Tamil films but first time he becomes full-fledged grandfather who rise up his orphaned grandchild single-handedly. He comes as a brisk old man and innocent being, brings out a perfect rustic in his perspective. The film housed him in an apartment, finds intolerable as his approach seems so naïve and provoking due to the residents indifferent attitude, only make console later when they all miss him to search. Lakshmi Menon has nothing much to do rather being Vimal’s love affair, enhanced the usual commercial aspects that a heroine deserves at love unrelated subject but she tried to bring some beautiful expressions. Their introduction at the same traffic signal quite bores… I have watched few films in latter year with same situation. What I liked in the film was the emphasis given to relationship and sharing tendency amid neighbors. In today’s apartment culture not many know who’s in next door and coming across a smile is a hard thing, but the grandfather role in the film celebrates their events. The film shot in and around Chennai has good cinematography and made colorful songs using simple backgrounds. NR Raghunanthan’s music plays a wonderful part of the film, where the expressions were fine tuned in lyrics which are written in an unusually way of later watching the videos. There’s nothing to complain about director (N.Ragavan) who has stitched carefully the yellow bag to bear enough, but what if the bag slipped from the hand is what the ending. Appreciate the team for a decent picture! that gives way to creek beneath. to cold wrapped Blue Mountains. regenerated the mind n body get console. The pictures shot while climbing the Blue Mountains (Nilgiris) at early morning hours... during my vacation to Ooty. On the occasion of completing nine years in blogging, I am glad to announce that my blog was selected as one of the Directory of Best Indian Blogs 2013 - 2014. June 20 marks the birth anniversary of my blog, when I composed my first blog post in year 2005 and blogging became a track changing in my life that let me touched from every corners of this world. I was nothing to do in this world, rather watching television and gaming in computer before started to blog; it was the habit of reading newspaper and magazine through which I was introduced to blogs. I had no idea about blogs initially, but I was looking forward to own a space on internet such as creating a website for myself and thus my (Jeevan’s) world exits. 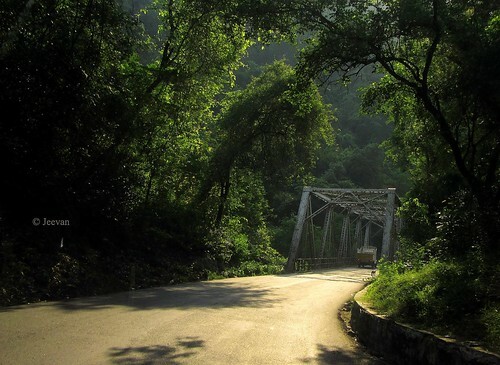 Today I have come across a long distance in blog and what it has taught me was lot and sharing is one significant reason that doesn't want me to leave this place. Each passing year I am getting away from the wonder feeling of turning a year around and I don’t get into a mood of triumph something, for which I guess perhaps the way of looking at blogs has changed and sharing has become my main course which kept away my counting overall. Today many social networks has emerged but I still strongly believe in blogs and nothing gives me content like writing a blog and the worth of sharing it gives was not even the real life recognized. Blog influenced a lot shaping my personality and changing my perspective and what I go through now is quite different from beginning. 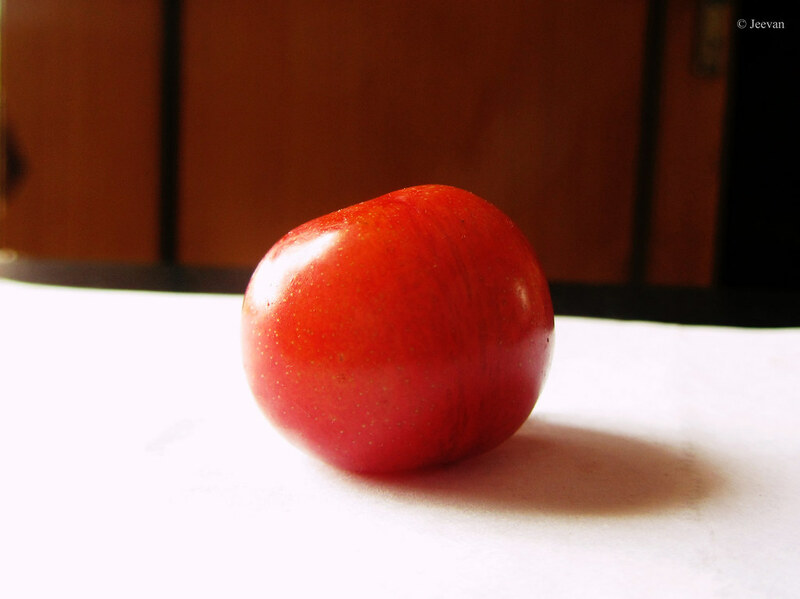 During my recent visit to Ooty I haven’t seen anyone selling plums or popularly called as Ooty apple, which is one of my favorite fruit of sweet and sometime sour. Later I heard this year the season failed to produce much plum, which has been demand on market. 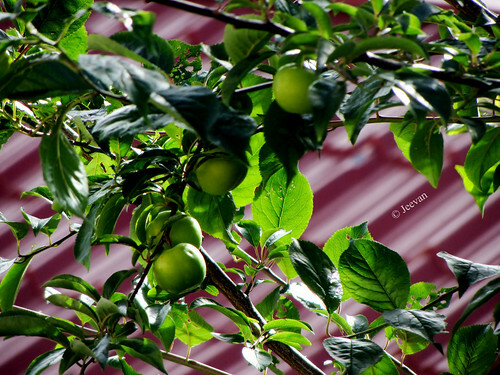 Last year when I vacationing in Kodaikanal at this time, I got to see plums tree in the cottage we stayed and the fruits were quite unripe to pluck and eat. The only thing I could do was to make a picture out of it. The unripe plums have tight, shiny skin and are green or very light in color, but as they ripen the skin becomes less taught, slightly thicker and the fruit becomes pliable when pressed. A Good plum feels heavy for its size and free of bruises and large dark spots. Plums are an important temperate fruits which is used both as fresh and in preserved form. Among the two types of plum (European and Japanese) introduce in India during 1870 in Himachal Pradesh, only Japanese plum has been recommended for commercial cultivation. Apart the Himalayan ranges - the primary producers of plums, the Nilgiris of south India also grows plums on a limited basis. Though India is not a market for temperate fruit, the country grows approximately 12 varieties from the Prunus Salicina species. The Plum season is ranged from late April through June. sometime a tool of destruction. 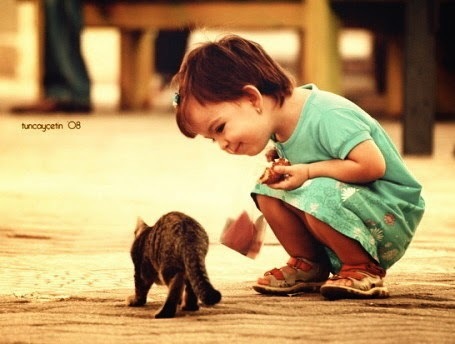 enrich in peace and harmony.